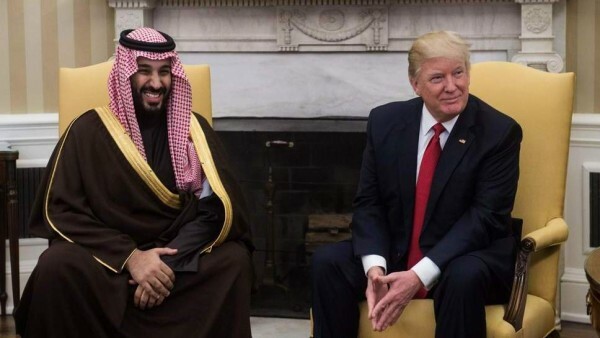 Brothers-in-arms: Saudi Prince with Trump. Saudi Arabia's Crown Prince Mohammed bin Salman is said to have told a top aide in 2017 that he would use "a bullet" on Jamal Khashoggi, a journalist who was murdered last October if the latter did not return to the Kingdom and end his criticism of the Saudi government. The conversation, intercepted by American intelligence agencies, is the most detailed evidence to date that the Crown Prince considered killing Khashoggi, a columnist for The Washington post, long before a team of Saudi operatives murdered him inside the Saudi Consulate in Istanbul on October 2, 2018, and dismembered his body using a bone saw, a New York Times report said on Thursday. If neither of those methods worked, the Crown Prince said, then he would go after the slain journalist “with a bullet”. The Crown Prince Mohammed said that Khashoggi’s articles and Twitter posts were tarnishing his image as a forward-thinking reformer. “Evidence collected during my mission to Turkey shows prima facie case that Khashoggi was the victim of a brutal and premeditated killing, planned and perpetrated by officials of the State of Saudi Arabia,” Callamard said. “Woefully inadequate time and access was granted to Turkish investigators to conduct a professional and effective crime-scene examination and search required by international standards for investigation,” she said. Khashoggi’s murder violated international law and the rules that regulate relations between countries and the status of diplomatic missions, she said. “Guarantees of immunity were never intended to facilitate the commission of a crime and exonerate its authors of their criminal responsibility or to conceal a violation of the right to life,” she said in a statement released by the office of the UN High Commissioner for Human Rights in Geneva.